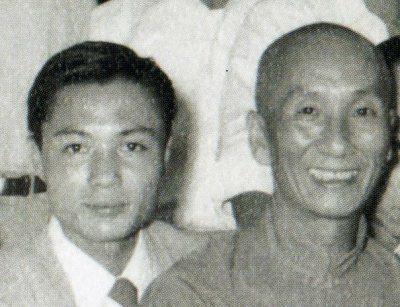 年輕時的黃淳樑師公和葉問宗師A young Sigung Wong Shun Leung (left) with his Sifu Grandmaster Yip Man. Many people in the Wing Chun community have heard a story about Bruce Lee and Grandmaster Yip Man. That was after Bruce Lee became famous, he returned to Hong Kong and asked the Grandmaster to allow him to film the Grandmaster performing the wooden dummy form and in return he would give him a big chunk of money (it is said the amount he offered could buy an apartment in Hong Kong .) However, the Grandmaster turned it down. Time has changed. Students of martial arts have a relatively easier time when comes to learning the art. There are a lot more teachers teaching the art than in the old days. Many Sifus (or teachers) teach more openly and more willing to give out the information. Books, DVD’s, on-line learning and videos on the YouTube are easy to find to help the students of today on his path to master his chosen art. On one occasion while talking about the differences between learning martial arts in the old days vs present, Sigung Moy Yat revealed a moving story that few know about him and Grandmaster Yip Man. At one point Grandmaster Yip Man was sick. Sigung Moy Yat would go to the Grandmaster’s house and take him out to the park for fresh air. After taking the stroll in the park, Sigung Moy Yat would take the Grandmaster to the restaurant for some food. (I venture to guess Sigung Moy Yat paid all the bill in the restaurant also.) Then, he would take Grandmaster home for him to get some more sleep. Day after day for few months, the Grandmaster taught Sigung Moy Yat one technique. (Yes, one technique!) Sigung Wong Shun Leung was also very close to the Grandmaster Yip Man. For years he often accompanied the Grandmasters to many functions. Sisukgung Yip Ching also wrote a story on his book, “Ip Man – Portrait of a kung fu master.” The Bot Cham Do (Wing Chun Butterfly Knives) is “the most advanced and secretive” part of Wing Chun system. Yip Man at his late year chose to teach Bot Cham Do to a very loyal student. Since practicing and teaching Bot Cham Do takes a lot of energy, this student noticed Yip Man was totally drained out of the energy after each class. So the student made up an excuse not to continue learning the knives from the Grandmaster to prevent him damaging his health. With the society keeps changing, the way the martial arts are learned would most likely keeps evolving. Yet, the precious relationship between a Sifu and a student would probably never go out of style. 對於西方的文化 我並不太熟悉 但我一直很重視"師道" 跟 "武德"